This Asian-inspired dish transforms humble chicken into a combination of must-have flavors you will love. If you haven’t really delved into cooking with Asian flavors yet, Sweet and Spicy Sticky Chicken is perfect for a first try since it’s fairly easy to take on, uses basic pantry ingredients and is well worth the effort. Daikon (Japanese radish) might be the most unusual ingredient here. If you have trouble finding it, radishes will work as a substitute. Whisk together the sugar, lime juice, soy, ginger, garlic and chili flakes in a large bowl. Set aside. Heat a large skillet over medium high heat and saute the chicken skin side down until golden brown about 10 minutes. Turn over and sauté the other side for 10 minutes. Remove to a plate and set aside. Discard the fat. Add the sauce to the pan and bring to a boil over medium high heat. Simmer until slightly thickened about 3 minutes. Return the chicken to the pan lower the heat to medium low, cover and cook until done, turning a few times about 12 minutes for dark meat and 8 minutes for breasts. Remove the chicken to a platter and cover with foil. Heat the sauce to boiling and reduce the sauce until syrupy about 3 minutes and then pour over the chicken. 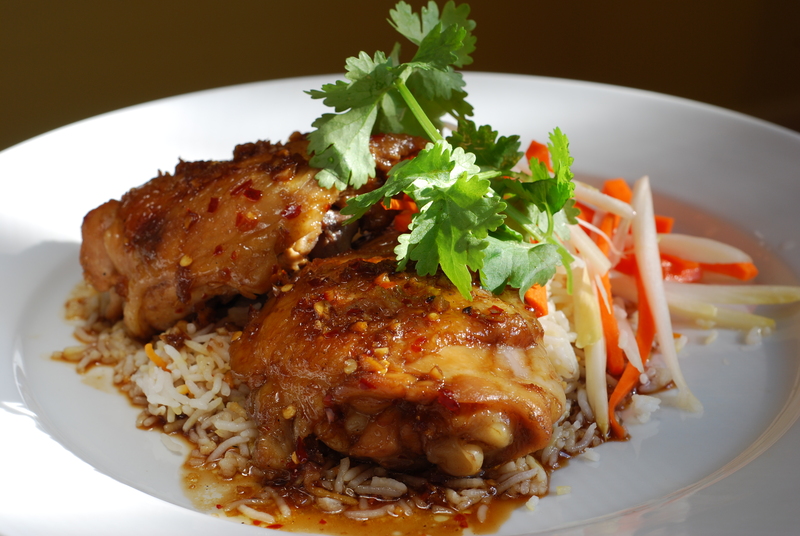 Surround the chicken with the carrot salad and garnish with cilantro sprigs.